1. Once crossed the 2nd link bridge, traveled straight for abt 10km, and take the Gelang Petah exit and exit left. 2. Go straight for abt 2km til the end of the road, i.e. T-junction, make a left. 4. Drive for abt 11km,til you reach the end, a t-junction. Turn left here. Along this road, you should see the shell stn on your right(as mentioned before almost imeediately.) 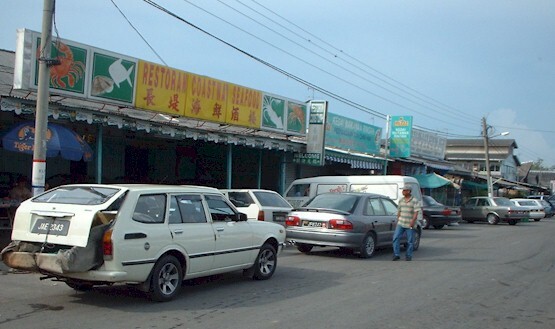 After shell stn , about 200-300m you should pass by Restoran Tian Lai. If got chance try the seafood here. It's better than Kukup. The salted egg crayfish, yum yum..
5. After the left turn from point no.4.,will be a long drive for about 23km. Till you reach a cross junction traffic light. At this junctin, turn right you'll arrived in Pontian, go straight you'll reach Pontian Kecil. For Kukup, you'll want to turn left. 6. Another long drive for abt 20km drive to Kukup.. Parking at Kukup is a nightmare. It's better to park at the private carpark or, the bus station. I parked at the bus station and it's within walking distance to kukup. .. If you drive all the way into kukup where the restuarants are, very difficult to do 3pt turn to come out. Good thing with parking at the resturant is free if you're a customer. Edited by Ender, 16 May 2008 - 01:10 AM. Dude u're awesome , really awesome! Thanks alot!!!!! �Live for nothing or die for something, your call. - John Rambo? power la bro. u reallie noe malaysian roads well. BTW on the way back.. at the traffic light (T junction) before u turn toward JB at Pontian .. turn left toward the sea... there are a few DVD shops... might wanna stock up.. cheap ah! I don't really know malaysia route that well. I used the GPS map software to plot out the route, that's how I know. I been to kukup only once using the same route as plotted by the GPS software. Anyway this is a new hobby of mine, colleague or my self want to go to some destination be it SG or malaysia, I'll help out to plot the route with the software..
Edited by Ender, 16 May 2008 - 09:29 PM. What coincidence, I am going to Kukup this weekend too. Base on Google Earth map, there seem to be a short cut without going further North and then come down South. Think will only shave a few km, but I am going to try that. What short cut u taking? If its going to be kinda off road type or into small kampung lonely road better dun take a risk ba how long u planning to stay at kukup ? BTW u like BAK PAU, TAU SAR PAU and PEANUT Pau? 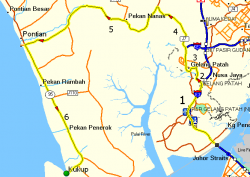 Look at the map.. right before Pekan Nenas .. around no. 4 ... turn right into that shop houses ... there is a pau shop .. see beh good! Dun worry i have more than 20+ pages worth of malaysia chop in my passport, been entering malaysia for sometimes alr, i always keep u wallet , one is my usual wallet, another is just some loose change, with abt 50 - 80 RM and T&G card , Jusco Card and Hawk Tayar card. Not bad with the directions. Heard u going to Genting again.